Baltneta Review 2019: Is Baltneta a Good Hosting? Lithuania-based web hosting provider Baltneta was acquired by Atea Group in 2015. They focus on providing quality internet solutions to businesses of all sizes in Nordic and Baltic countries, and their services include VPS solutions, dedicated servers, and cloud hosting. Privately-owned data center services provider Baltneta was established in 1996 in Kaunas, Lithuania. In 2015, they announced that they have been acquired by Atea Group – a premier IT infrastructure solutions provider in Lithuania – to boost the quality of their services and increase their market share. Currently, this company offers VPS, cloud hosting, and dedicated server solutions to businesses in Lithuania and several other countries in Europe including Russia, Ukraine, Finland, and the United Kingdom. The Baltneta website is available in Lithuanian, Russian, and English. Baltneta owns state-of-the-art Tier 3 data centers that provide uninterrupted server accessibility. Some of the measures they take to protect their clients’ data include local storage, encrypted virtual servers, emergency recovery solutions, two-factor authentication, and network perimeter protection. They perform weekly data backups, but clients can also request unplanned, manual data backups at any time. All backup operations are carried out on secondary servers in remote data centers. Unlike many other vendors that offer free data backups, Baltneta’s backup solutions cost extra. Virtual dedicated servers come with Xen virtualization to give users access to dedicated CPU, RAM and SSD resources. In addition, both Linux and Windows operating systems are installed on virtual servers that have fixed IP addresses. Baltneta internet solutions include fiber-optic internet packages that give clients speeds of up to 500Mbps. 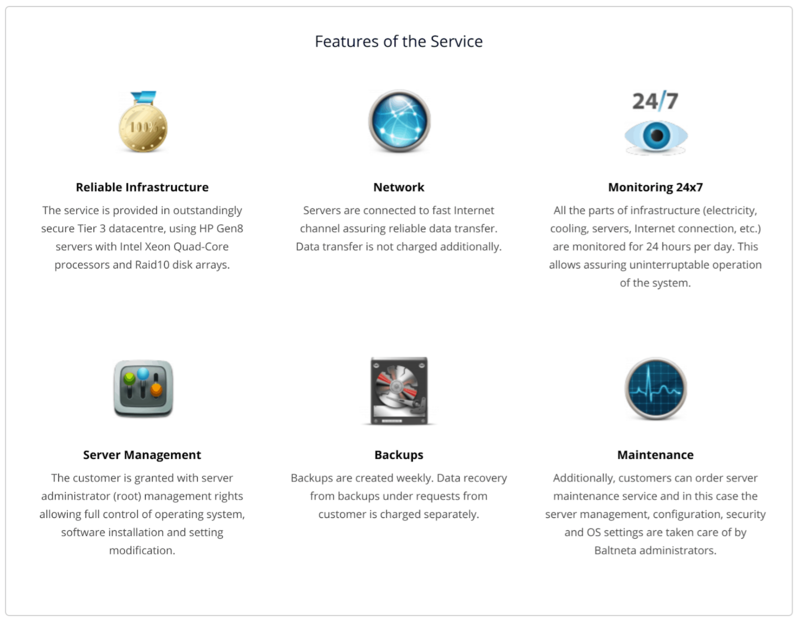 They have an easy-to-use CloudStack management portal where clients can manage their servers. Baltneta’s euro-denominated hosting plans are a bit expensive compared to other vendors, and you can sign up to their plans on a monthly or annual basis. There is no money-back guarantee and no refund policy for if the uptime falls below their 99.98% availability guarantee. The Baltneta customer help desk is available 24/7. They have put together a team of hosting professionals who have the experience and “people skills” to deal with practically any issue, and you can reach out to them by telephone or email. You can also message them via social media, but otherwise, there is no live chat. There is also no support ticket system and no knowledge base. Baltneta has crafted pretty good hosting packages that seem to be quite competitive at least within Lithuania. However, they charge extra for many of the services (such as backups) that you would expect to get for free with other hosting providers. This makes their plans more pricey. Wondering how Baltneta stacks up against other Web Hosting companies? Enter any other Web Hosting company and we will give you a side-by-side comparison.